She looked at me with wide eyes while sitting in her sled. I reassured her, gave her a hug and then gave her sled a slight push. More than 20,000 children wind up in the ER every year across the country due to sledding injuries according to a study from the Center for Injury Research and Policy of the Research Institute at Nationwide Children’s Hospital in Columbus, Ohio. In fact, the report shows that of those 20,000 ER-bound sledding victims, 26 percent of the injuries were fractures. Twenty-five percent were cuts and bruises. More than 50 percent occurred during a collision — and collision injuries were most likely to result in traumatic brain injuries. Of those who wound up at the ER due to sledding accidents, 34 percent involved head injuries and 4.1 percent required further hospitalization. In other words, sledding can be dangerous. How could I live with myself as I pushed her down the hill? Because of the look on her face when she got to the bottom of the hill. Something scary turned out to be something fun. A fear was vanquished. A challenge overcome. And a great form of accomplishment. It opens doors for social interaction with other kids that you can’t get on Facebook or through your Wii gaming system. Those interactions are rampant outdoors on a snowy day — through building snow forts, snowmen and holding snow ball battles. But sledding especially challenges the social barriers. It helps children grow in ways they can’t indoors holding down couch cushions. So for something so vital to children — despite the inherent risks — perhaps the most disturbing trend involves the dwindling places where children are allowed to go sledding. 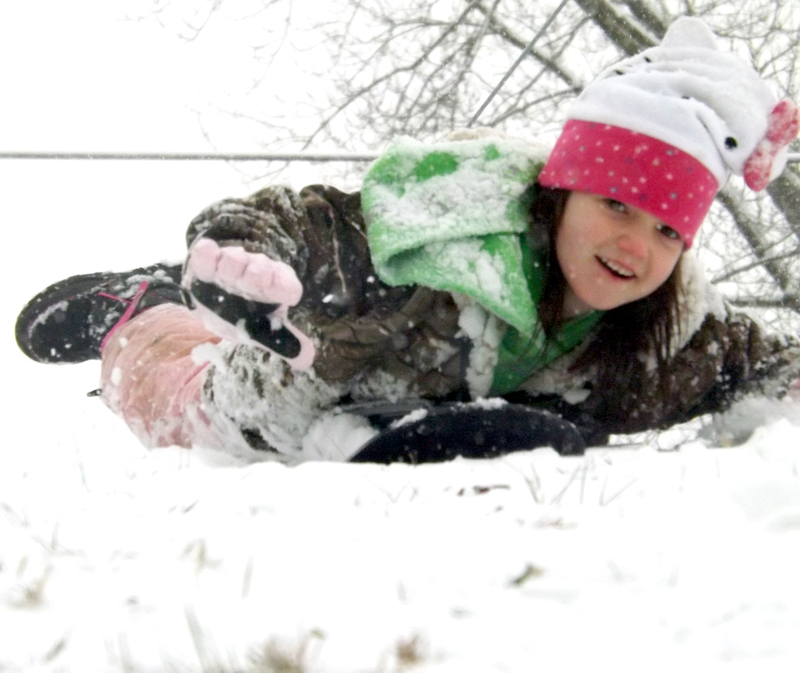 Due to fear of injuries and the massive lawsuits that can come from them, property owners are banning sledding. In fact, a number of cities — such as Lincoln, Neb., and Des Moines, Iowa, have outlawed the pasttime. Nearby sledding hot spots are few and far between, too. Phone calls to the Susquehanna Valley Country Club and Danville State Hospital — two popular locations for sled-riding children and their families — turned into dead ends. Neither place allows public sledding, as is the case with numerous other local locations. Even members of a local visitor’s bureau and two recreation authorities were unable to list more than a few possible spots — and most of those fell through after a few followup phone calls. Yes, sled riding is dangerous, but so is riding in a car, crossing a busy street or jumping on the equipment at a playground. My daughter has sledded quite a lot in her young life. She has yet to sustain a serious injury. She did, however, break an arm on a slide at preschool several years ago. According to an older study from the Centers for Disease Control, more than 200,000 children 14 years of age and younger are treated in hospital emergency rooms across the United States. Most accidents, nearly 70 percent, occur on public playgrounds. They are usually associated with climbing equipment, slides and swings. More than one-third of all playground injuries are severe, with children incurring fractures, internal injuries, concussions, dislocations and amputations. Approximately 15 children die each year from those injuries, about half of which are from strangulation and one-quarter from falls from equipment. Lincoln, Neb., has a playground. So does Des Moines. So does pretty much every community in our Valley. And I’m not suggesting we change that in the least — just that playgrounds are statistically more dangerous than sledding, for what it’s worth. So where are the sledding opportunities? Why don’t we have more places for kids to publicly interact and play on a snowy hillside? ~ by zaktansky on February 6, 2015. This entry was posted on February 6, 2015 at 5:03 pm and is filed under Outdoor kids.You can follow any responses to this entry through the RSS 2.0 feed.You can leave a response, or trackback from your own site. Next: Should schools be required to address gun safety?